Spring Breakers kommer släppas i mars! 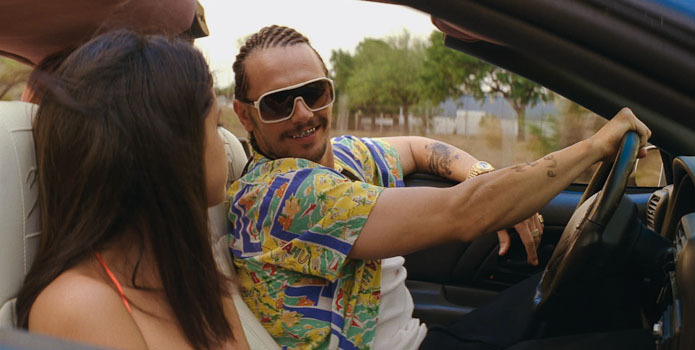 Spring Breakers kommer släppas fredag den 8 mars 2013! Folk twittrar om vad dom tyckte om Spring Breakers! Sneak peek på Spring Breakers! Den 6 september till 16 september kommer Selena vara på The Toronto Film Festival! Nya Spring Breakers bilder + lite om filmen! Korine’s impressive canon of films poetically chronicles the minor heroics and self-aggran-dizing intensity of marginalians, unseen, ignored and dismissed by a willfully ignorant world. In Spring Breakers, his attention turns to four female co-eds (Ashley Benson, Selena Gomez, Vanessa Hudgens and Rachel Korine) in an unnamed college town. Desperate to hit the beach, but flat broke, they rob a coffee shop with fake weapons, steal a car, head south and start to party hard. Their fun gets rudely interrupted when the cops bust into their apartment and find things young girls should not be enjoying. Locked up with no bail money, they despair until a local petty gangster (James Franco) springs them. Two of the girls stay with him as his entourage and, ultimately, his hitmen; while the other two drop out, exhausted, disoriented and longing to experience that rush of freedom one more time. 2 nya Spring Breakers bilder! Ashley Benson (som är med i Spring Breakers) var med på On Air with Ryan Seacrest. Då sa Ryan (programledaren) så här om Selena: "She's so generous. She does so many charitable things that people don't even know about....We really think the world of her. She's the greatest." Sen sa Ashley även lite fakta om Spring Breakers. Att filmen kommer förmodligen släppas våren 2013!